William R. Hinshaw4,5 [William R. Henshaw6,7]. Hinshaw, William R., head-of-household, age 33, born in Alabama; parents born in Alabama; first marriage, married 8 years; occupation: farmer, general farm; owned farm. Hinshaw, Sarah A., wife, age 29, born in Alabama; parents born in Alabama; first marriage, married 8 years; 1 child, 1 living. Hinshaw, Ethel M., daughter, age 7, born in Alabama; parents born in Alabama. Collins, Clinton, lodger, age 22, born in Alabama; parents born in Alabama; occupation: laborer, general farm. Hinshaw, Wm R., head-of-household, age 43 [unclear], born in Alabama; parents born in Alabama; occupation: farmer, general farm. 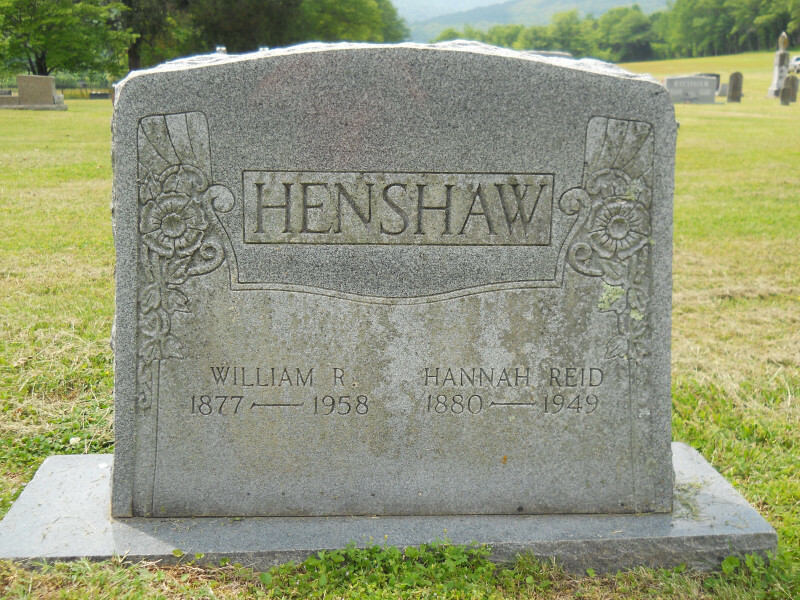 Hinshaw, Hanah [or Sarah - unclear], wife, age 39 [unclear], born in Alabama; parents born in Alabama. Hinshaw, Ethel M., daughter, age 17 [or 14 - unclear], born in Alabama; parents born in Alabama; attended school. Hinshaw, William R., head-of-household, age 53, born in Alabama; parents born in Alabama; first married at age 24; owned home; no radio in home; occupation: farmer, general farm; not a war veteran. Hinshaw, Sarah H., wife, age 49, born in Alabama; parents born in Alabama; first married at age 21. Sims, Robert T., son-in-law, age 32, born in Alabama; parents born in Alabama; first married at age 23; occupation: laborer, general farm; World War I veteran. Sims, Ethel M., daughter, age 27, born in Alabama; parents born in Alabama; first married at age 18; occupation: laborer, in house. Sims, William T., grandson, age 8, born in Alabama; parents born in Alabama; attended school. Austelle, Judge T., boarder, age 25, born in Alabama; parents born in Alabama; single; occupation: laborer, general farm; not a war veteran. Henshaw, W. R., head-of-household, age 63, born in Alabama; completed 2 years of high school; on Apr 1 1935 was living in the same house; owned farm ($3000 value); occupation: farmer, farm. Henshaw, Hannah, wife, age 59, born in Alabama; completed 1 year of high school; on Apr 1 1935 was living in the same house. Sims, Robert, son-in-law, age 42, born in Alabama; completed 3 years of high school; on Apr 1 1935 was living in the same house; occupation: school bus driver, country. Sims, R.T. Mrs, daughter, age 37, born in Alabama; completed 2 years of high school; on Apr 1 1935 was living in the same house. Sims, William, grandson, age 18, born in Alabama; completed 3 years of high school; on Apr 1 1935 was living in the same house; attended school. 1920 census, Collins Township, Jackson County, Alabama; roll T625-19, ED 39, page 7A, line #37, dwelling #131, family #131. 1930 census, Collins Precinct, Jackson County, Alabama; roll T626-20, ED 22, page 1B, line #91, dwelling #22, family #23. 1940 census, Collins Precinct, Jackson County, Alabama; roll T627-40, ED 36-22, page 1A, line #32, household #8. 1880 census, Jackson County, Alabama. 1900 census, Collins Precinct, Jackson County, Alabama; ED 36, page 207B, line #54, dwelling #46, family #46. 1910 census, Collins Precinct, Jackson County, Alabama; ED 37, page 53A, line #15, dwelling #56, family #56. Contribution from Dan Hinshaw citing: marriage license. 1920 census, Collins Township, Jackson County, Alabama; roll T625-19, ED 39, page 7A, line #43, dwelling #133, family #133. 1920 census, Collins Township, Jackson County, Alabama; roll T625-19, ED 39, page 7A, line #27, dwelling #129, family #129. 1930 census, Collins Precinct, Jackson County, Alabama; roll T626-20, ED 22, page 1B, line #71, dwelling #18, family #19. 1930 census, Collins Precinct, Jackson County, Alabama; roll T626-20, ED 22, page 1B, line #69, dwelling #17, family #18. 1930 census, Collins Precinct, Jackson County, Alabama; roll T626-20, ED 22, page 1B, line #64, dwelling #16, family #17.